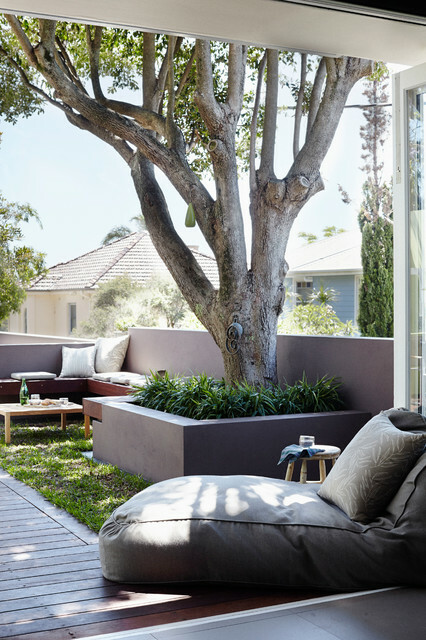 A stylish rooftop garden on Sydney's Northern Beaches. Newman Kwong carpenter - What type of materials the planters and walls made from? WHAT TYPE OF TREE ? What kind of grass did you use under the tree? Hi Stephiek the tree is under-planted with Dianella caerula 'Little Jess', it's very low maintenance and clumps naturally so is very effective as a ground cover. Hope that helps! OOOH! Where is the lounge chair from? Thanks! Backyard bliss. A nap-time spot that straddles the indoors and out is the perfect setting for a snooze, as it allows you to enjoy the calming sounds of gentle bird calls and rustling leaves, but in an area that’s protected from the elements. With a pillowy lounger, a plush cushion for extra comfort and a gorgeous leafy backdrop, this inviting indoor-outdoor setting is my idea of heaven. 11. Shaded lounge. A courtyard garden with just a hint of grass makes for a relaxed and inviting space for chatting, reading or napping beneath the shade of a mature tree. The low wall doubles as a backrest for the built-in bench and ties the courtyard in with the design of the house.